-Scientic name: Volvariella volvacea (Bulliard ex Fries) Singer. -Comon name: paddy straw mushroom or just straw mushroom. -Synomym name: syn. Volvaria volvacea, Agaricus volvaceus, Amanita virgata, Vaginata virgata). -Volvariella is a genus of mushrooms with deep salmon pink gills and spore prints. The genus is estimated to contain about 50 species. Many sources list Volvariella as a member of the Pluteaceae family, but recent DNA studies have revealed that Pluteus and Volvariella evolved separately and have very different DNA. These studies show that Volvariella is very closely related to "schizophylloid" mushrooms like Schizophyllum commune. Some species of Volvariella are popular edibles in Europe, accounting for 16% of total production of cultivated mushrooms in the world. -Volvariella volvacea (also known as paddy straw mushroom or just straw mushroom); is a species of edible mushroom cultivated throughout East and Southeast Asia and used extensively in Asian cuisines. In Chinese, they are called “cǎogū” (straw mushroom), in the Philippines they are called “kabuteng saging” (mushroom from banana), in Thai they are called “hed fang” and in Vietnamese they are called “nấm rơm”. They are often available fresh in Asia, but are more frequently found in canned or dried form outside their nations of cultivation. 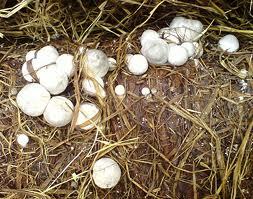 Straw mushrooms are grown on rice straw beds and picked immature, during the button or egg phase and before the veil ruptures. They are adaptable and take 4-5 days to mature, and are most successfully grown in subtropical climates with high annual rainfall. There is no record of their cultivation before the 19th century. They resemble poisonous death caps, but can be distinguished by their pink spore print; the spore print is white for death caps. Despite this fact, many people, especially immigrants from South East Asia where the mushroom is common place, have been poisoned making this mistake. Unfortunately, it is easy to mistake the death cap mushroom (Amanita phalloides), as well as some other Amanita species, for this edible species due to similarities in appearance. This mistake is the leading cause of lethal mushroom poisoning in the United States. Volvariella and Amanita cannot be distinguished in the early "button stage", that, for many, is considered the best stage to collect Volvariella for consumption. Like Amanita, the paddy straw mushroom has a volva, or universal veil, so called because it is a membrane that encapsulates the entire mushroom when it is young. This structure breaks apart as the mushroom expands, leaving parts that can be found at the base of the stalk as a cup-like structure. This distinctive species of Volvariella is apparently not native to North America, but it has been introduced to that continent by human activity and can be found in woodchips, compost, greenhouses, and gardens when conditions are right. Volvariella volvacea is a robust species for the genus, featuring a grayish brown cap that is streaked with silky fibrils. The prominent volva at the base of the stem is brown to nearly black. -Ecology: growing gregariously or in clusters; found in woodchips, greenhouses, gardens, compost piles, and similar locations; capable of appearing year-round, depending on climate but usually found in summer when outdoors; apparently widely distributed (in introduced settings) in North America, but more common east of the Great Plains. -Cap: 5-16 cm; egg-shaped when young, expanding to convex or broadly conic, becoming broadly convex or nearly flat; dry; radially streaked with hairs; gray to brownish gray or grayish brown or nearly black when young, with a paler marginal area; soft; the margin not lined, but often splitting with age. -Gills: Free from the stem; white becoming pink; close or nearly crowded. -Stem: 4-14 cm long; up to 2 cm thick; tapering gradually to apex, with a swollen base; dry; whitish or brownish; silky; the base encased in a thick, sack-like volva that is brownish gray to nearly black above and whitish below. -Odor and Taste: Not distinctive. -Chemical Reactions: KOH negative on cap surface. -Microscopic Features: Spores 7-10.5 x 4.5-7 µ; more or less ellipsoid, or somewhat ovoid; smooth; inamyloid. Pleuro- and cheilocystidia variously shaped but mostly fusoid-ventricose; to about 115 x 35 µ. Pileipellis elements not gelatinized. Clamp connections absent. 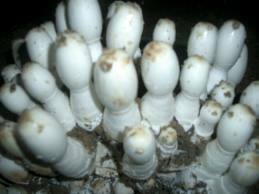 Straw mushroom is one of the best edible mushroom that could be grown in tropical climate within 8-12 days to fruit. It is one of the most highest protein content, fast growing mushroom. Thailand is the world largest straw mushroom producer which produce this mushroom more than 600,000 ton per annum. Anonbiotech Centre has been in this business to produce pure culture and active spawn for decades, one could visit their website at www.anonbiotec.com or www.anonworld.com/. Some of Shouth East Asia countries produce straw mushroom as a good and nutritious food for using in their countries and exporting. Source: Wiki pedia and www.anonworld.com.